that doesn't have ANY detail on it - like no trim. ever come back to FINISH it: paint, trim???? 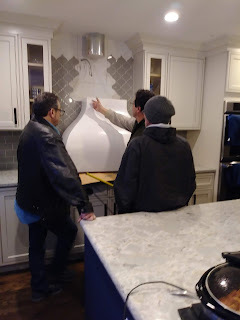 Back when we had 'Self-taught' as our kitchen designer (daughter of first crappy contractor - want to be caught up to speed - read these links), they started to construct a cabinet for the hood insert to go into. I hated it. My only hood criteria was, 'don't make it look like another cabinet. Nothing boxy.' I have lots of cabinets, so lets break it up a bit. What they were building was a huge box that we were bumping our heads on. That is when they realized that the insert that they ordered was going to be too large for our hood. 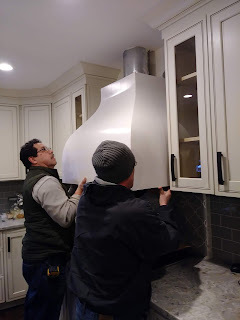 We are a family of tall peeps, so we couldn't have the hood jut out into our head space. They swapped the insert out for a smaller version. Luigi is now claiming that when he asked for the specs for the insert that was sitting in my flipping dining room for the past year, that I inadvertently gave him the specs for the original over-sized insert. This has got to be the most frustrating experience of my entire life. I call Luigi multiple times a day. He either doesn't answer, doesn't respond, or tells me that they are almost done building my hood. What? When Luigi and Hood-maker guy attempted to leave with my expensive insert that day in January, I told them that this made me uncomfortable. I was unsure if I would ever see Luigi again. I told him this to his stupid face. Luigi said in his Italian accent, 'Oh no, we bring back. Next week. It OK.' I looked at Hood-maker guy and asked him when he would be done fixing it (of course they weren't about to rebuild it, just take a little off the top, etc - so the 'we almost -a done rebuilding it' is all more lies). Hood-maker guy said 'Tuesday.' Then we had the polar vortex, so nothing. My biggest fear is that I will not like what they make - after all this! There was a Property Brothers on last night as I was making dinner. Coach was like, 'Oh look. They have a nice hood.' He was trying to be funny, but I had to try really hard to not cry. My other biggest fear is that I will never see my insert again or the money that I gave Luigi back in July to finish my kitchen. At this point I hope to just get enough work out of him for me to feel like we are even. Then I will find someone else to finish the odds and ends. (No phone jack, no light in the pantry, no vent covers, missing recessed lights, etc.). My sanity hangs in the balance here. Oh dear! This is the stuff that nightmares are made of!!!!! Truer words were never spoken. Our neighbor/friend is sending him a threatening letter. From there, small claims court. Exhausting.